I remember driving home from work that night and being terrified of what I might find when I arrived. Upon entering the house, I drank some water, I breathed deeply, and then I took not one but three pregnancy tests. Whatever the result, I had to be sure of it. I stared intently at the tests. I was definitely pregnant. My thoughts ran wild. This was a big deal, and I was doing everything out of order. (I was raised to be married first, then a baby was to follow.) I was scared to tell Bill (my fiancé now; my boyfriend at the time), and I was worried that this was not at all what he had signed up for. I was especially worried about disappointing people. But Bill and I had a deep conversation about our convictions, hopes, and dreams, and we scheduled a “first-time pregnancy” doctor’s appointment. We started to wrap our heads, hearts, and arms around this perfect little child that had started to form inside me. Some of the people closest to us did not approve of the unplanned pregnancy, but many of them were relentlessly loving and encouraging—especially my older sister, Bethani, as well as Bill’s entire family. Bethani let me know that I was loved, that my child was loved, and that we would be able to get through this together. There was so much to be excited about. Previously, I had been told it might be difficult to achieve pregnancy without assistance. Not that we were trying, or even had this planned, but this baby was the ultimate surprise—the ultimate gift. I dedicated myself to being the best mother there could be, and it was such solace to know that my body was working the way it was supposed to be working. People often asked me if I wanted a boy or girl. The only answer I ever gave was, “I don’t care, I feel so blessed, I just want a healthy baby.” I was even teased for being so “politically correct,” but it was a true statement that I felt in my soul. There was a part of me waking up, something coming alive that I had never felt before. It was untainted, pure, unconditional love for the son or daughter inside me. Bill and I had Bethani join us on our 4 ½ month ultrasound. The time had come—we were going to find out if this person who had stolen our hearts was in fact Madelyn Genevieve or Brenden Richard. We all sat patiently as the ultrasound tech checked to make sure the baby was put together perfectly (everything was fine on this front, by the way). The technician scanned over his parts, and I shouted out “IT’S A BOY!” Bethani waved her “Blue Cake” picture in celebration (you can see it below). From there on out, he was Brenden, my bubba, and he was Bill’s third son. That night, we celebrated with dancing and friends. Bill was absolutely thrilled. (He had said the whole time he thought it was a boy.) I was convinced that Brenden would act just like his father, and that he would be just as handsome. The months ticked by, and I just continued loving on my son—this precious boy I was given. We would sing, talk, and laugh together. All of my adventures were now “our” adventures. I was the crazy lady who looked like she was talking to herself most of the time, but Brenden was hilarious. He had such funny comebacks, and he was great at making me laugh and keeping me entertained. The best part would be coming home from work. Bill would start talking, and once Brenden heard him, he would start what I would call his “kung fu lessons.” No question, Brenden would be just like his dad. We were a family of three; you just could not see all of us yet. We worked on the house all summer in preparation, not only for Brenden’s arrival, but also for upcoming holidays. Bill and I had offered to host Thanksgiving, and we wanted to finish remodeling to make room for family (and for lots of food). The end result was fabulous. My family totally rocked that holiday—all three of us! Then Christmas came, and Bill and I spent nights out shopping. We purchased additional accessories for the house, as well as Brenden’s Christmas gifts. Bill picked out two outfits for him, and we also decided on his swing and stroller. After we wrapped them and put them under the tree, we signed “Love, Mom and Dad” next to his name on the Christmas tags. I kept those Christmas tags. Now more than ever, I am grateful for that. The New Year started with smiles and laughs as we continued preparing the house for this little child running around. If Brenden was going to be like his father, I knew I would have my hands full. Bill and I had nothing when it came to baby items. When I first became pregnant, it was overwhelming how much we would have to buy, borrow, learn, and do in order to be prepared as parents. On March 1, 2016, at 36 ½ weeks pregnant, I woke up and realized that something definitely felt “off.” I was not sure what it was, but I thought maybe—just maybe—we would have our baby today. Around 10 a.m., I started having contractions. They went from 10 minutes apart to 7 minutes apart. I called my physician. I asked if I should still come in for the appointment I already had scheduled for that day or if I should go straight to the hospital. She requested that I come in early, so they could start by assessing how far along I was. Bill and I were ecstatic! We loaded up Brenden’s car seat, his going-home bag, and a bag for Bill and myself. We were beaming as we arrived at the doctor’s office. I even had a contraction as we pulled up. Bill helped me walk in, and the receptionists were so kind—in fact, they were just as jittery as we were! Brenden was on his way! The staff brought us into the heart monitor room. Having sat in that room many times, I felt very comfortable, knowing what they were about to do; it was standard procedure. They placed the pad on my belly, and the obstetric sonographer continued to move it around. She then proceeded to ask me when I had last felt Brenden. “What do you mean when did I feel him last? I felt him all morning, I’m having contractions; what do you mean?” She then stated we would wait for an ultrasound room to open up because her monitor might not be working properly. Waiting those five minutes felt like an eternity. Bill and I sat in the ultrasound room holding hands. Finally, the technician moved the wand over Brenden’s heart chamber, and I saw no movement. I had just been here the Friday before. His heart was beating perfectly, and he was simulating breathing movements. There is a deafening silence that comes over you when you are told your child, your heart, is no longer alive. The silence becomes a physical manifestation of your grief, as if the Earth swallows you in its void. I was numb. Bill begged them, “Check again! Look again! This can’t be happening!” We wept as we tried to process the devastation. The drive from the doctor’s office to the hospital was only a few miles, but it felt like we were in the car for an hour. We replayed the last few days in our heads. What happened? What were we going to do? Would we survive this? How do you tell people the most horrible news when you cannot even repeat it to yourself? Many things went through my head as we waited for my room to be prepared. While my sister and Bill’s family started to arrive, I wondered why this little boy that I had fallen so in love with had to be taken from me. The next 36 hours were agonizing. There was a mistake with my epidural, which was not placed correctly the first time. This unfortunate mishap caused more than twelve hours of painful labor, after which a second epidural was administered. But nothing compared to the pain when the doctor broke my water, when the reality of the moment overtook me. I cried longer than there were hours in that horrible day. By the next morning, we were still waiting for my body to play catch-up. My body was rebelling against all efforts to dilate over seven centimeters. That evening, the doctor checked and I was back down to four centimeters. This was not good news. I had been in labor for over 30 hours already. Throughout this journey, Bill amazed me at every turn. He was so excited to have another boy. He was Brenden’s dad, and as his son lay dead inside of his heartbroken fiancée, he had to leave the hospital to make arrangements at the funeral home, going over details needed to lay our son to rest. Bill was, and always will be, such a strong man. But Bill is not my knight in shining armor. He is my marred protector whose armor has battle scars. He has been in the lowest trenches with me. Though my heart aches for him, I am so thankful that God gave us each other. We share the bond of being Brenden’s parents, and that bond is unbreakable. Thankfully, Bill was back with me at the hospital when we got the news of my body not cooperating. We needed an emergency caesarian section. Bill dressed for surgery and watched helplessly as my body convulsed on the table from shock. I was broken in every way imaginable. On March 2, 2016, at 8:41 p.m., the doctor pulled my beautiful boy from my body. Brenden clocked in at 8.3 pounds and was 20 inches long. He was breathtaking. The bittersweet surprise was how much he looked like me. I had been convinced he would be a miniature version of Bill. The tears flowed freely. A boy who shares his father’s compassionate character along with his mother’s good looks would ultimately have turned us both into pushovers. The entire moment was void of any joy; no happy cries, no gasps of excitement, no hugs and laughter. There was only silence. Bill brought Brenden over to me, and we let our tears rain over this handsome, lifeless child. He was perfect. We were able to spend the next four hours with him. We held him, loved him, kissed him. We cried over the dreams lost, wishing he would just open his eyes—wishing everything would be okay. Through our cries there was an undoubting, unwavering peace that brought me to my knees. This peace came me from the knowledge that Brenden’s perfect soul was with Jesus. I knew this in my bones. Your grace abounds in deepest waters. Your sovereign hand will be my guide. Where feet may fail and fear surrounds me. You've never failed and You won't start now. God surrounded my heart and my mind with His goodness. The goodness that He knows what is best and the goodness that He will make a beautiful thing out of this loss. The goodness that, even though I didn’t have Brenden as long as I would have wanted, I loved him well. I never took a moment for granted. Saying goodbye to Brenden that night was the hardest thing I have ever done in my life. How do you say goodbye to your son—the son you never got to say hello to? I cried that entire night. It’s an emptiness I pray no one will ever have to endure. 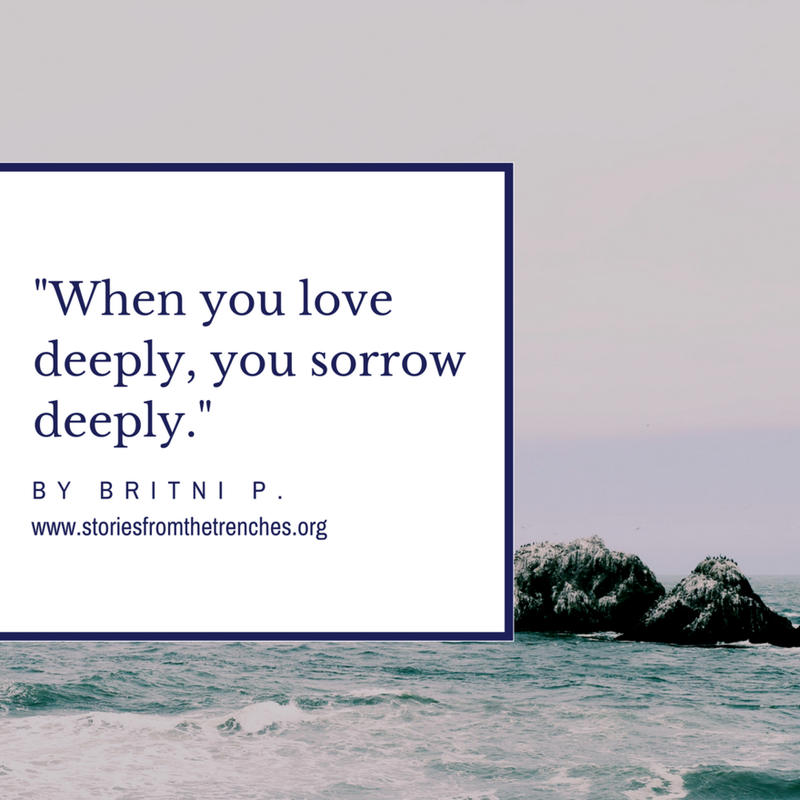 When you love deeply, you sorrow deeply. Those words had never been so real to me before. It felt like there was a hole in my heart that weighed 8.3 pounds and had strawberry blonde hair. I loved this little boy more than I had loved anything in my life. Two days later, I left the hospital with casted footprints, a lock of hair and the outfit they took pictures of him in. The drive home was quiet, almost fog-like. I wondered if anyone in the other cars knew what I was going through. Then, we walked into our home. It was gut-wrenching. Brenden’s nursery was in our room. There was no “shutting the door” to make it all go away. Bill and I went to bed that night in each other’s arms, sobbing until we fell asleep. This is not what we thought our first night home from the hospital would be like. The next days and weeks felt the same. There was too much silence. There should be a baby crying while I tried to figure out what he needed. There should be no time to clean the house and do dishes. My house was spotless and perfectly quiet. It was not supposed to be like this. It was not supposed to be so . . . empty. My parents flew down that weekend to spend some time with us. There was ample time to weep and to hurt for this loss. And in that time, healing came. When my father first saw me after losing Brenden, he knew that this was not what he had wanted. This was not what he had wished for when he questioned the order of things. Brenden broke each and every one of our hearts so tremendously that we could not worry about who was right and who was wrong. The only way any of us could make it through this was by holding onto what was left of each other. I often think of two other women on my hospital floor that night. There were eight of us in total, and three of us had lost our children. Were they blessed enough to have nurses like the ones I had that night? I hoped that they also had nurses who cried with them, and who let them know they were not alone In their sorrow. My nurses let me talk about Brenden and what the idea of him truly was to me and Bill. I pray that those women found a peace that surpasses all understanding. I pray that they found the only peace you could ever find in this vicious, sorrow-filled storm—the peace that God is good. Every day, there are gentle reminders of my boy. These reminders are hand in hand with tears and joy, but mostly they come with hope. It is the hope that life does goes on, and the hope that this pain does not define me. Although there is an empty crib and a silence, God is working in me. Learning to live without Brenden has been a challenge—I am not a career woman anymore, but I am also not a fully functioning mommy. Above any worldly title, I am His. I am a different Britni now, and I am a better Britni because of Brenden. People have asked me, “How are you so strong? You seem to be handling things so well.” They ask how I am not mad at God for allowing this. It is a valid question, and everyone is allowed to travel their own journey of grief. Yet, in response, I ask them to envision being on the tiniest boat in the biggest storm of your life. Would you throw out your one and only life preserver? God is the only One that can keep my head above water in the most painful storm of life. Looking back, I am grateful that God ignited the love inside of me for this child. God knew that He was going to allow this loss, and I am honored that God made me grateful for the time I had with my son. Loss burns away all those things that are no longer essential to our lives. I have learned a lot through this journey, but mostly how to love unconditionally in every way, shape and form. If I knew every ounce of what I now know, the absolute tragedy of your death, and immense heartbreak not having you has brought, I would still choose you. A thousand times over, I choose you.